Even Fred Flintstone needs a break from meat now and then. I’ve been eating lots of red meat lately, so I was pleased that this month’s Charcutepalooza challenge presented the option of making a fish or seafood mousseline. What a delightful break from all of the meatiness. If previous challenges invoked the Flintstones, then this challenge was akin to Bambi. As I embarked upon this challenge my vision shifted from a Quentin Tarantino blood and guts filled trailer to a dreamy, gauze-filtered Jane Austen period piece. I pictured a tea party, replete with platters of finger sandwiches and fluffy delicate mousseline, and birds and butterflies fluttering around the garden table. Yet even Bambi has its dark side. In this case it was the absolute cyclone that hit my kitchen while making and photographing this recipe. (Come to think of it, this seems to happen with most Charcutepalooza challenges). If you saw The Sixth Sense, do you remember the scene where all of the kitchen cabinets are flung open in a moment of fearful suspense? That is the state of my kitchen at this moment – utter disarray, overturned pots and pans, rejected food props, gooey knives, soiled kitchen towels, flung open drawers and doors. I am sure the refrigerator is still ajar, and most likely a few 4-legged gremlins are lurking about. Mighty scary, indeed. So if you will excuse me, I have some cleaning and possible exorcising to do. Then I will change my clothes and sit down for my Charcutepalooza-Jane Austen inspired tea party. 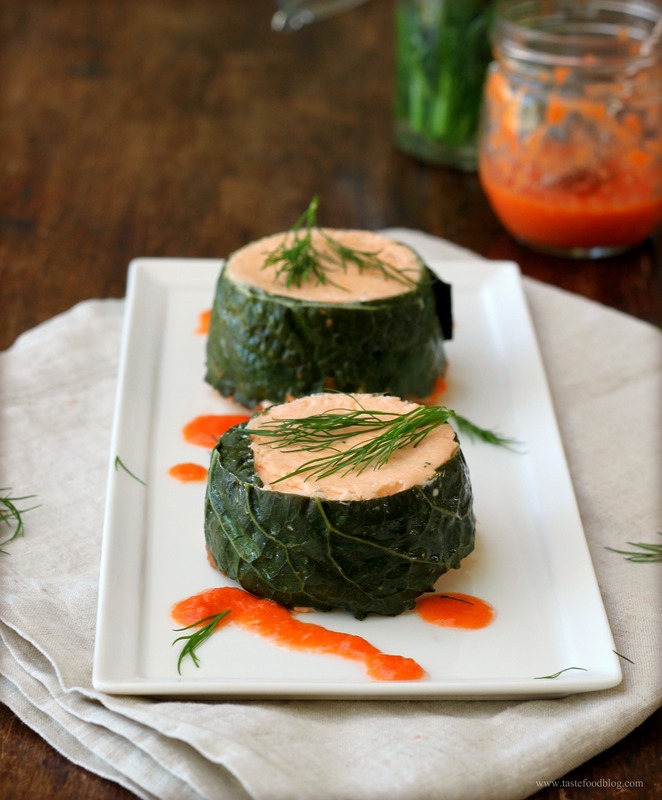 I love kale and frequently pair it with salmon, so I couldn’t resist creating a ribbon of kale to encase the mousseline. As a surprise, I nestled a scallop in the middle of the mousse, which is an optional step. (Note: If you add the scallop it will infuse the salmon mousseline with a lovely sweet and briny flavor). To pull it all together on the plate I made a simple tomato coulis which adds a bright acidic note to the luxurious mousse. Makes 6. Bring a large pot of salted water to a rolling boil. Add kale leaves and blanch 15 seconds. Remove with tongs and shock under cold water. Lay flat on a kitchen towel and pat dry. 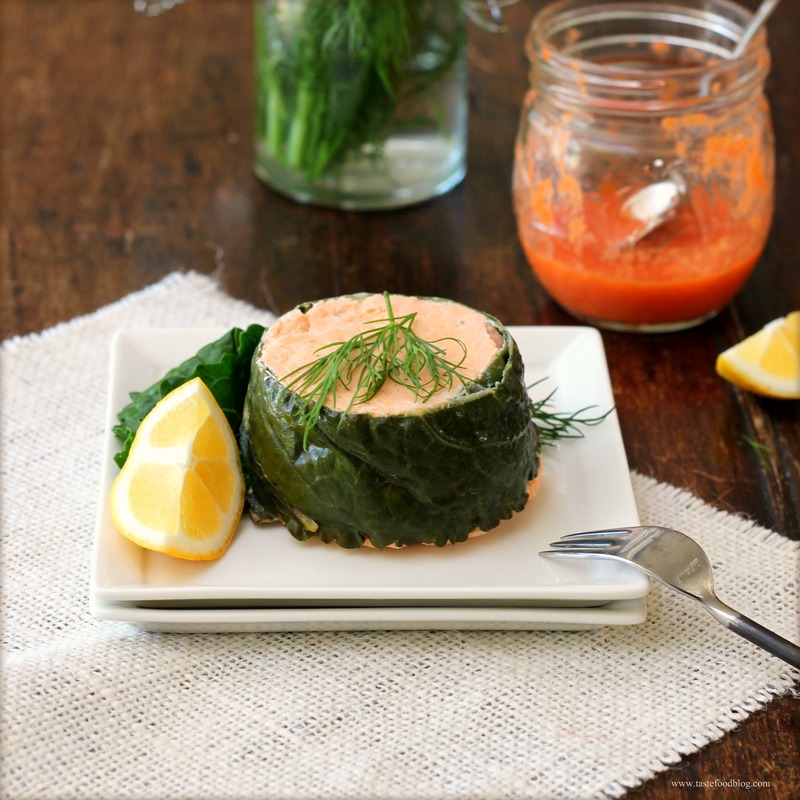 Combine salmon, egg whites, shallots, dill, salt and pepper in a bowl of a food processor. Process until completely smooth. Transfer salmon to a bowl and refrigerate 30 minutes. Preheat oven to 300 F. (160 C.) Lightly oil (6) 3/4 cup ramekins. Carefully line the sides of the ramekins with the kale leaves. Remove salmon from refrigerator. Fold in 1/2 cup whipping cream. Return salmon to refrigerator. Whip remaining 1/2 cup cream in bowl of electric mixer until soft peaks form. Fold into salmon mixture. Spoon half of the salmon mixture into the ramekins. Nestle a scallop half in center of salmon. Top with remaining salmon. Place ramekins in a baking pan. Fill the pan with enough boiling water to come halfway up sides of ramekins. Cover with buttered parchment. Bake in oven until puffed, firm and cooked through, about 35 minutes. (A toothpick will come clean when inserted in the middle). Remove ramekins from oven and water bath. Invert onto a serving plate. Drizzle Tomato Coulis around the mousselines. Garnish with dill and lemon. Make shallow incisions around the stem with a paring knife and scoop out the stem. With same knife, make a shallow X-incision in bottom of tomato. Bring a saucepan of water to a rolling boil. Plunge tomato into water for 10 seconds. Remove and submerge in a bowl of ice water. Remove the cooled tomato from the water. Peel away skin. To seed the tomato, cut the tomato in half. Use your fingers to scoop out seeds and remove the core. Combine tomatoes and olive oil in bowl of food processor. Process until smooth. Add salt and pepper. Let stand at room temperature for one hour before serving. (Can be made one day in advance. Cover and refrigerate.) Serve at room temperature. Some day when I am feeling brave and quite sure of myself, I will try this. Meanwhile, I would do almost anything to serve this for this weekend’s dinner party! Your mousseline looks delicious! I love the use of the kale, one of my favorite vegetables. I’ll have to try this one day soon. Although I made head cheese, I am also becoming tired of so much red meat…. I love how you always talk about how messy the kitchen gets during the meat making process, because I can relate. This looks so worth it. Great recipe. I think I can polish off those beautiful rolls with tomato coulis in no time..absolutely love seafood. I think this is one of the most creative recipes I’ve seen. I’ve never seen anything like it. Beautiful. Gorgeous presentation. I LOVE kale and just posted a recipe with it this week- same wavelength! This looks great! I love salmon. I have to admit that I have never had a mousseline. For some reason, I thought they were served like a pate’ with crackers. I guess that I thought of it as a lighter pate’. It seems like you can to it either way. This certainly sounds delicious. Love the touch of the scallop in the middle. I am inspired again, Linda. Thank you. We prepared this last night and they were delicious. Thank you for the recipe! Wow that look wonderful! This is my next culinary assignment and ive been looking everywhere just to find the best recipe that fits me. And this is definectly what i was looking for! Is there any way i can send the whole recipe to my email?